So Lindi, take it away! 1. Even the best runners have bad days. Meb Kefleghizi and Shalane Flanagan as as good as anyone out there, and were well trained, but put up worse performances in Boston this year than last. 2. One may need to dial back performance expectations after seemingly minor interruptions to training. Shalane Flanagan said she only had 9.5 weeks of hard, marathon-specific training rather than her usual 12 week cycle due to a minor injury. This could have contributed to her reported heavy-leggedness and disappointing ninth-place performance. 3. Prioritize staying healthy and free of injury above all else. Indeed, having to take time off for injury will hurt your training most in the long run. Dathan Ritzenhein lead the men for several miles, then backed off when the leaders dramatically picked up the pace, saying he wanted to be sure he would stay healthy and be able to keep training for the Olympic Trials which are 10 months from now. 4. Even the elites don’t run perfect splits. Just like us average joe’s, the elites run more slowly on the uphills than the downhills and the flats, and therefore have race paces that may vary up to 30 seconds per mile. Pacing should be fairly steady but adjusted for effort based on terrain. 5. Show good sportsmanship no matter what. 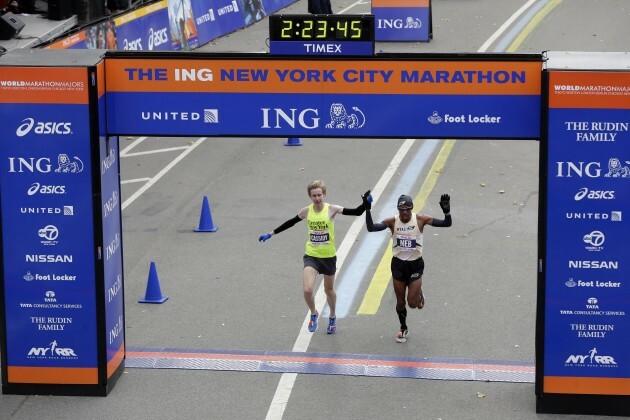 When Meb (who won Boston last year) crossed the finish line in eighth place, he made the day of Hillary Dionne by grabbing and raising her hand and crossing together. As a mere mortal, I probably would not get the same reaction, but can still cheer on and encourage my fellow competitors. How did the 2015 Boston Marathon most inspire you? Great advice! I especially love the anecdote about sportsmanship.